Sunday was the 10th Ocean Drive 10 miler, part of the Ocean Drive Marathon. The weather was doom and gloom for the past week. They called for rain, with a chance of thunderstorms, high for the day topping out around 67, in the low 50's for the start,but the good part was winds out of the south. That means no 10 miles of headwinds! The weather report was almost spot on. The storms came through Saturday nite, and it was fogging, with a mist at the start. I had Shoreturtle spend the nite at our place in Wildwood, so he wouldn't have to travel the 1:45mins from home, before the race. My sister in law came in from Boston, to do the race. She had done a few smaller races, 1-2 milers, and 5k's, in the past, but this was her 1st 10 miler, and she trained this winter for the run. I was nervous/excited for her. I took her and my oldest son out for a ride Saturday, to show her the course, so she would know what to expect. We got up early Sunday, and headed to the finish, where we got on the bus to Cape May, and met up with JoyRun . We hung inside at the Congress Hall Hotel, to keep warm before the race. It was nice to hang there, and talk running with the gang, and watch the other runners, both 10 milers and marathoners prepare for the race. We waited inside until about the last possible minute. It was cold at the start, and I made a last minute decision to keep the pullover on.. not a good choice! As the race started, we took off, and as usual for me, as much as I tried to start slow, I went out too fast. I had a right side stitch for the first few miles. I did the 1st mile in 7:50 & mile 2 in 7:32. I wanted to stick around an 8min pace. I need to work on a slower start to the longer races. Shoreturtle caught me and flew by around the 3-1/2 mile mark. We both asked how the other was doing, and off he went. I had him in my sight for the next few miles, but lost him when we reached Wildwood Crest. I realized at about the 2 mile mark, that I should have listened to my gut, and ran without the pullover. It was warming up quickly, and I didn't want to "overheat" like I had done at the Ugly Mudder. I had a talked to my wife as to where she would be with the boys. If the weather was bad, she was going to be at the hotel at our corner, under cover. If they weren't there, they would be at the finish line. As I hit the 8 mile mark, I took off my jacket, and was going to hand it off to her, but since they weren't there, I hid it under a dumpster at the hotel. I knew it would be safe there. Man I felt so much better after ditching the jacket. I had a bounce back in my step. The only negative was that the calf that was acting up this past week, was starting again. I pushed through it, and wanted to finish strong. When we made the turn off Atlantic Ave, onto Pine Ave, and headed towards the boardwalk, our old pal the wind was kicking! It was like year's past, running into the wind. Luckily it was only for 2 short shore blocks. As I got onto the boards, I started to kick the best I could. As I got closer to the finish, I saw my wife, boys and her father waiting there, cheering us on. I saw that my son had made signs to cheer us on, and that was an awesome sight. I finished the 10th mile in 7:51, not my fastest mile of the race, but a nice finish. I met up with Charlie, and congratulated him on his race, and headed up to watch for Joy & Ami to finish. My sister in law gave my wife a heart attack. As we were waiting and cheering on the runners, her phone rings, and it was Ami. Crazy sis-in-law called to tell her she was hitting the boardwalk. We spotted Ami, and I glanced back at the clock, and saw she could beat her goal of 1:40. With us cheering her on, she pushed it to the finish, and crossed the line at 1:38:42 ! She did awesome. She had said she left a little in the tank, and I couldn't have been prouder of her. She did her work this winter, and it paid off. She is talking about trying a 1/2 marathon this fall. It was a great day and race. I knocked over 10mins off my time from last year. I think the wind had something to do with that. I got out and ran on Tuesday & Wednesday. Wednesday, I did an 8 mile out and back to Mercer County Park. It was warmer, and not as windy, no big gusts. I ran the 1st 4 miles at race pace, and took it easier on the final 4 miles. One thing that I did feel, is a pain in my right calf. Felt like a knot back there. Hopefully it goes away in the next few days. I don't want to be nicked up for the 10 mile race on Sunday. Ocean Drive 10 Miler preview.. with PIctures! The wife and I sans kids & dogs, headed down to Wildwood, to open the house for the season. With the Ocean Drive 10 miler next weekend, I planned to run most of the course, to get reacquainted with the winds! I had her drop me off at the starting area, and I was going to run back to our house, which the course passes right by. As we were headed to Cape May, the toll bridge on the course, the last hill, was closed for street repairs, due to reopen on the 27th. We spun around and headed back into Wildwood, hit the Garden State Parkway, and headed into Cape May. I told my wife that I would cross the bridge, she was a little nervous about leaving me, wondering how I would get back. I told her if I'm not back in an 1:20mins, you know I couldn't cross the bridge, and I would figure out a root back. So, with the wife gone, I started out on the course. As I passed by their convention hall, I noticed their billboard. As I passed the 1st mile mark, still running along their beach, I passed the road where I was to turn left. My mistake added about 3/4 mile on to my run. Heading out of Cape May, you encounter the 1st of 2 bridges. This is a nice looong hill. It's around the 3 mile mark. Once you get to the top, it's a gradual downhill, and you bear off to the right, onto the Ocean Drive, and head towards Wildwood. The next few miles are mostly a back bay marshy area, nice and flat. As I got closer to the closed toll bridge, I came upon a warning sign. Even though I knew it was closed to pedestrians, the big sign did not say that, and I was going to use that to cross. Just past the sign, there was a smaller flat bridge to cross. The wind picked up a bit here, with the open area. As I got closer to the bridge, and seeing the closure, I was a bit nervous if they wouldn't let me cross. I would have had to turn around, and run aprox 3 miles back, and about 4 miles on the GSP, just to get back close to Wildwood... not good! As I ran up the bridge, I told the 1st worker I saw, that I had been dropped off in Cape May, and had no idea the bridge was closed to pedestrians, and had no other way to get to Wildwood. He gave me a look, and told me to be careful crossing, and that I could not cross it later. I thanked the man, told him I would not be back, and kept going. As I got through the construction area, I snapped a picture, and kept on running! As you can see, there wasn't much room to cross. I was now free and clear to finish my run, with only the winds to slow me down. The winds weren't bad today. I can only hope the conditions will be like this next Sunday for the actual race. I stayed on the new route in Wildwood Crest, and I think this will be a plus with the winds. Usually we run the bike path in the Crest, until we hit the boardwalk in Wildwood. This year, we run on Atlantic Ave, a block off the beach, and I think the hotels will help blocking the wind for us. As I got closer to our street, I saw the hotel on our corner, Ala Moana. It should have been around the 8.2 mile mark, but with my 1st mile error, it was closer to 8.9 miles. I turned the corner to the left,and headed for home! I hit the 9 mile mark just past our house. It was a nice run. I was glad to be back downashore running. Maybe I can hold up this pace for the 10 miler next Sunday. Now who would put stickers on the back of a wrong way sign? 8 miles on Hump Day. Man it seems like this has been a long week. With the weather more spring like, highs in the mid 60's with a steady 15mph wind, I headed out after work to get my 8 mile run in. The wind was kinda a cross breeze for the 1st half, and more in my face on the 2nd half of the 8 miler. I did a loop from home, through Mercer County Park, and back home. While I didn't see as many runners out as I did on Tuesday, the few I saw didn't wave. Oh well, I'll continue to do what I do, and hopefully a nice gesture will rub off on the runners I pass. I felt a bit tired in the legs, from pushing it on the 6 miler the day before. I tried to slow my pace down. I kind of did that. What I have tried to do, and succeeded so far, is to run more upright, not hunched over. I think it has helped in my stride, and breathing. The other thing I have worked on, is to finish the last mile strong. It's a nice confidence builder, when you last mile is your fastest. Hopefully the weather holds out today, they are calling for rain, and I'd like to get out and run another 6 miler. Today was another 6 miler. I ran an out and back to Mercer County Park. It was a little overcast, but the temps were in the high 50's, so it was short sleeve weather. Being St. Patrick's day, I kept my eye out for a pot of gold. I didn't find it, but I did find $2.00! That was the most I have found while running. I didn't know it was two singles, until I got home, and checked. I saw green, picked it up, and put them in my pocket. I felt great during the run, and wanted to run the 6miles at an 8:00 min pace. There was quite a few runners out in the park, and I have a problem with all but one of them. Would it kill you, when a fellow runner waves, to wave, or at least acknowledge that I made an effort to be polite. The only one who gets a pass, was the guy pushing a baby in a running stroller, while holding his dog's leash. That guy had his hands full. I plan on running 8 miles Wednesday, and another 6 on Thursday, all leading up to running part of the Ocean Drive course on Saturday. I had 2 x 6 miles runs this weekend. Saturday, I got out with the trailruns group, to Clayton Park, and ran the hills & trails. Clayton has some nice hills to it, and with me not being the greatest running up hills, this is a good workout, to build strength & confidence on them. This was my last weekend run with the group for the 2 weeks. On Sunday, I got out and did a 6 mile out and back with the new Kayano 15's! 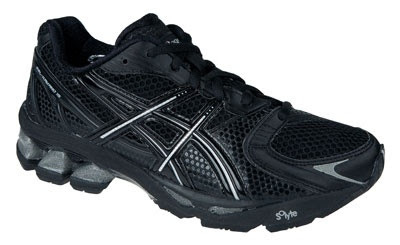 You can only get the Kayano 15's in black at Foot Locker. They are an exclusive color to Foot Locker. They go for $140.00, but if you sign up for their free VIP card, you get a $10.00 coupon you can use it on them. I normally don't buy my running shoes at the mall, but I love the black look. I did my research, and they are identical to the white ones, you can buy everywhere. I was pumped to get out and do a nice run in them. It was awesome. There is nothing better than running in new shoes. They felt great, nice cushioning and stability. Asics got it right with the slight improvements over the 14's. Just the staggered lacing made a difference in how they felt. I did the 6 miles in 48:18 (8:02 avg. ), with a last mile at 7:24! I'm telling ya... it's the shoes! Another great weekend of running, and now it's time to get ready for the Ocean Drive 10 miler, that is 2 weeks away. Well, I went out and got a new pair of running shoes today! I've been looking forward to this day for the last few weeks. I could tell I was in desperate need of new shoes. I replaced my Asics Gel Kayano 14's, with the new 15's! I went with the all black model... it's exclusive to Foot Locker. I did my homework on them, and they are identical to the white models. I wanted to make sure of that, since I don't normally buy my shoes at a Foot Locker. I had a lot on my plate today, so like any kid with a new toy, you just can't wait to get home and play with it. I got out and ran a quick 2.3 miles. Man it was a sweet run! Nothing beats the 1st few runs in new shoes. You can feel in the heel, the more gel they added. Now I am dying to break them in a bit, and run the Ocean Drive 10 miler in them. If you need a stability shoe, I love the Kayano's. They are the only shoe I have run in, in the last 5 yrs. A tale of 2 x 5k. I might be doing a St. Paddy's Day 5k on Saturday, so for today's run, I did a mock 5k race, and took the 2nd 5k, to recover. It was in the high 40's, overcast with some sprinkles mixed in, and winds out of the west. After the 16 mile run on Sunday, I took an extra day off. I felt good on Monday, not that sore, but decided not to run until Wednesday. I felt good during the 1st 5k, and wanted to negative split each mile. The 1st mile I started out conservative, and improved each mile. My splits were 8:00, 7:36 & 7:18, with the last .10 at .43sec., a 7:37 mile avg. That came out to a 23:38 5k. I was happy with that, considering I do no speed workouts. If I do run the 5k race, I would like to see if I could get under 22mins. The run back, the 2nd 5k, I actually took it easy, and ran it in 27:18. I think this was my last run in the Asics Gel Kayano 14's. I am way over on the mileage, and I can feel it in the legs. I am going to try and pick up the new 15's Thursday! Bill & Ted's Excellent 16 mile Adventure! Today, I traveled to Seaside Heights, NJ, with Shoreturtle to do a training run with Ted & Joyrun . Finally we were to meet the legendary Ted! We paired off, and I ran the 16 miles with Ted, and a Shoreturtle ran with Joyrun. It started out a bit cold, so as usual, I overdressed, ohh.. and I forgot to grab my water. It got warm real quick, and as we left Seaside, and headed into Island Beach State Park, we ditched the jackets behind some brush.at the entrance to the park. As Ted and I where at about mile 6, a red fox was in the road, staring at us, as we running towards it. A car came up from behind us, and scared it in to the woods. We got close to it, as it was lying in the woods, I got my camera out, and it took off before I could snap a picture. It was really cool looking. We turned around at about the 8 mile mark, but before we did, we followed a boardwalk, to a little dock that overlooked the bay. As we headed back towards Seaside, we passed Joy & Turtle. As you can see, someone thought that seeing us, meant you could stop! When we got back to our jacket drop off, I hit the men's room, and got some much needed water. I needed that, since I forgot my water back at the car. There was some great scenery, and as we got back on the boardwalk, it's was awesome to be running next to the beach again. It was a great run. I felt like I was an anchor on Ted. The man is a machine! He set a nice pace. We averaged 9:13 min miles. Let me tell ya, it was a tough keeping that pace, considering I haven't run miles like that since Philly, and running 7 miles on the trails Saturday didn't help! It was great to run with Ted, and I look forward to running with him again. It looks like Joyrun is well on her way to have a great NJ Marathon experience, both her and Turtle did awesome. Fyi.. I owe Turtle & Joyrun writing credits for the title. Today, when I packed my running gear, I had the thought of running somewhere different. On a Thursday, I normally don't go into the city of Philadelphia, but I had to, so where better to run, than Kelly Drive, and relive some of the magic of the Marathon course. It was a nice day to run, with the sun out, temps in the high 40's, and a slight breeze. There was a nice mix of walkers, bikers & runners out. I wanted to stay close to the 5 mile range, I didn't want to overdue it, like last week. I started out around the Art Museum, and ran one of the few hills that were part of the Marathon course. As I was running it, I remembered this part of the course, and I could hear our pace group leader pushing us up and down the hill. Man, he was good, Pacer Dan! He kept us at such an even pace, I really owe him, he made my marathon experience awesome. Anyway, I headed out Kelly Drive, and turned around, when the Garmin hit 3 miles. I felt good, and thought about going further, but came to my senses, and headed back towards the Art Museum. When I got around Boathouse Row, I got to thinking about how the crowd grew, the cheering intensified, and it pushed me to the finish. When I made the right turn, and saw the finish, it was an awesome site. I first saw my sister in law, and a littler closer to the finish I saw my wife & brother in law. Thinking about that today, running, made it seem as if it just happened. It was a great run, and I really enjoyed myself. 5.7 miles 46:39 (8:11 mile avg.). The last 2 days, I listened to the new U2 album.. I'll give it a thumbs up. If you are a fan of U2, I'd say go out and buy No Line on the Horizon, it's a solid album... do we still call them albums? I got out Wednesday after work, and got a nice 5 mile run in at Veteran's Park. The park was pretty quiet. There were a few runners from the local High School out, and I saw one other, a few walkers, and a couple of dogs playing at the dog park. Some of the bike paths were still packed with snow. Those spots where a little hairy, I sure didn't want to wipe out. I felt a lot better than I had my last few times out. The cough is gone,which is a good thing, and I guess the extra days of rest helped. It's funny, when you get into a routine, and you take an extra day off, you can really feel it, that 1st run back. I did the 5 miles in 43:00, a (8:35 min mile avg.). The weather rumor around NJ is 60's over the weekend! Sounds good to me! Feburary is in the books! Well, as March comes in like a Lion, here in NJ, Feb. is done, and I am happy to see it go! It started out great, got some nice long runs in, ran w/ the NJ Marathon group, did my own thing, and ran with the trail runs group, and completed another insane trail race in Reading,Pa. As the month ended, I have not been feeling all that great, so I am glad to get Feb. outta here, and bring on March. I got out Saturday, and did what should have been a great 8 mile trail run. It was the perfect morning to run, and it sucked that I wasn't feeling my best to enjoy it. The run did put me over 100 miles for the month, the 1st time I have run that much in a month since November. I did 106.98 for the month. Anyway, we got about 6" of snow here Sunday/Monday, so with the roads & paths iced over, I might just take this time to fully recuperate, and get back to running later in the week. I have the Ocean Drive 10 miler at the end of the month, so I'll have plenty of time to get prepared for it.